GitHub - workshopper/levelmeup: Level Me Up Scotty! An intro to Node.js databases via a set of self-guided workshops. Level Me Up Scotty! An intro to Node.js databases via a set of self-guided workshops. Want to be notified of new releases in workshopper/levelmeup? An intro to Node.js databases via a set of self-guided workshops. 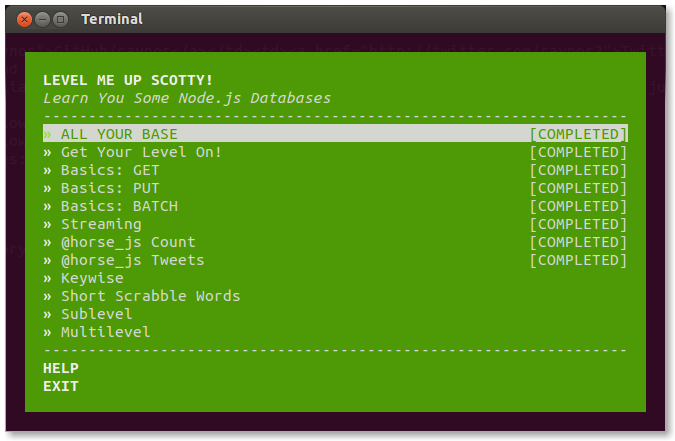 levelmeup will run through a series of Node.js databases workshops. Starting with the basic operations of LevelUP and moving on to more advanced exercises. levelmeup builds on the workshopper framework which is also used by learnyounode (Learn You Node.js For Much Win), a basic introduction to Node.js workshop application. levelmeup is Copyright (c) 2013-2015 Rod Vagg @rvagg and licenced under the MIT licence. All rights not explicitly granted in the MIT license are reserved. See the included LICENSE.md file for more details. levelmeup builds on the excellent work by @substack and @maxogden who created stream-adventure which serves as the original foundation for levelmeup.